A reporter who has spent 55 years in journalism has finally retired from the industry at the age of 76. Brian Stephens began his career at the Bletchley Gazette in 1958 and he went on to work for a number of newspapers in Sussex, including the Worthing Herald and Gazette, which he retired from at the end of last month. Other titles he worked for as a journalist included The Argus in Brighton, where he spent 14 years as business editor and motoring editor. Brian, pictured below, was filing copy right up until New Year’s Eve but has finally bid farewell to the Herald and Gazette after becoming one of its longest-serving reporters. Brian always wanted to be a reporter and at the age of 13 he took a job at the Bletchley Gazette, doing odd jobs on press night, before becoming a junior reporter at the title in 1958. After three years, he moved to the Worthing Herald, then three years later became news editor at the Shoreham Herald. Brian later became assistant editor at the Worthing Gazette and Herald, where he stayed until 1978, before joining The Argus as business editor and motoring editor, during which time he travelled the world and flew on Concorde. He returned to Worthing in 1993, working for the Worthing Guardian until his official retirement in 2003 but then rejoined the Herald for another decade as a reporter. Said Brian: “I have always been a news seeker. I like to be able to recognise a story. “One of the most challenging things has been the introduction of new technology. I’ve forgotten how to change a type writer ribbon and I’ve thrown away the Tip-Ex. “But you do get more freedom to let your thoughts flow onto the page. Google has opened up a whole world of knowledge you can apply to your writing to make sure you get your facts right. Brian said the workload of a reporter was now more onerous and there were fewer staff, with the Herald previously having up to 20 reporters but now just having four or five. He said he remembered getting a front page story after reading a police log upside down and finding out about a man being crushed in a rubbish van. In his retirement, Brian hopes to spend more time with his wife Helen, their two children and two grandsons. 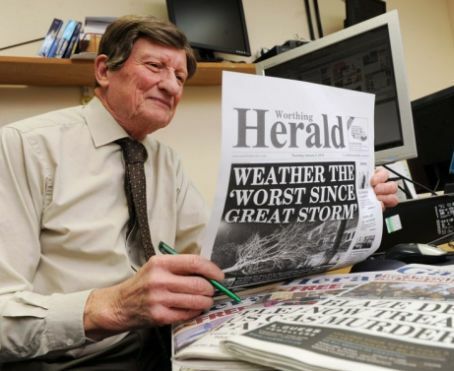 Good luck to you Brian in your retirement sir, you have been a fantastic servant to newspapers within the region, most recently with the Worthing Herald. I for one enjoyed working with you immensely and I’m sure that you will continue to keep your ear to the ground for a story even if it’s just for your own amusement. It’s a very hard industry to completely retire from, but you have certainly earned a break after more than 50 years! A very old colleague from the Bletchley Gazette wishes you a very happy retirement. You have more staying power than me. I retired from the Leamington Spa Courier seven years ago, just clinging on until I was 62. All the best, Helen Penrice.